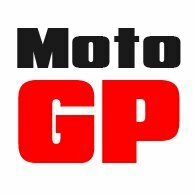 We here at Motolegends are suckers for a good pair of bike jeans. We like to ride in denim, although we are pretty scornful of those who insist on riding in a pair of high street Levis or Wranglers. The problem is that even we have become embroiled in the arms race that suggests that the longer the 'slide' time, the better the jeans. But, of course, it’s not that simple. Nobody is more concerned about protection in jeans than we are. But once you get to a slide time of over four seconds, we reckon you’re wearing something that is as protective as you’re probably ever going to need. Four seconds is leather levels of abrasion resistance, and we’ve never seen anyone wear through leather pants on the road. The six seconds of the Rokker Rokkertech jeans is super-impressive, but it’s almost certainly more than you'll ever need. 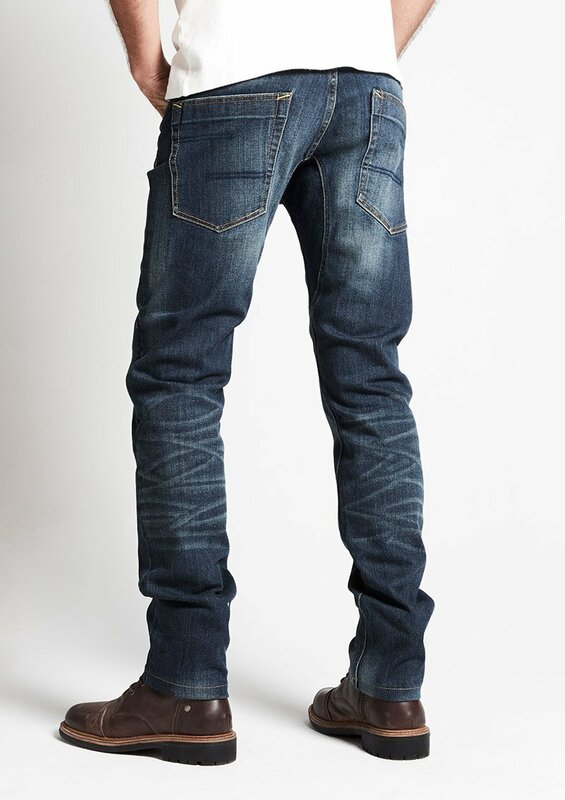 The 11 seconds of the Resurgence New Wave jeans is mind-bogglingly impressive, but OTT perhaps; it’s showing off! 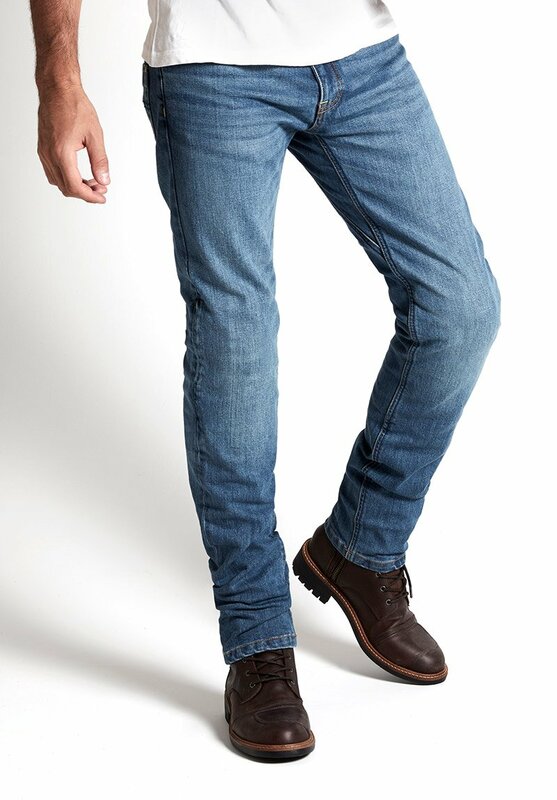 The Spidi J-Tracker jeans in dark blue. Now the J-Tracker jeans from Spidi deliver a slide time of just a little over two seconds, which initially sounds disappointing. But bear in mind that, on the road, if we come off the bike we tend to roll rather than slide. And, in truth, it’s still quite unlikely that you will slide on any one area of material for more than two seconds. For many people, me included, the Spidi J-Tracker are often the perfect protective jeans, and that’s because they are the most wearable, best-fitting, most jean-like riding jean on the market. Rokker’s Rokkertech jeans are nice to wear. They’re not, though, quite like a street jean; close but not quite the full cigar. But the Spidi jeans are. You could wear them all day, every day, and if nobody told you that they were a motorcycle jean, you’d never know. 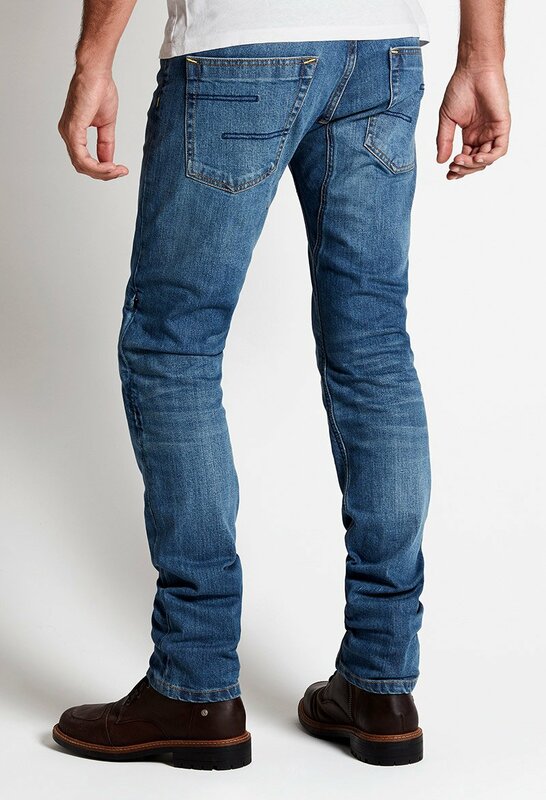 To wear, they are unquestionably the best and nicest protective jeans we, or anybody else, sell. The Spidi J-Tracker jean in dark blue. We also really like Spidi’s knee armour, and the way it fits. It is not shaped; it bends vertically and horizontally around the knee. So it’s nearly always well-positioned; it’s always comfortable whether you’re riding or walking, and it never creates an ugly shape around the knees. In this regard, we prefer it to D3O. What’s more, Spidi’s knee armour is so easy to take out or put in, because there’s a zip in the external leg seam. On the subject of armour, the jeans come with pockets for hip armour, although it doesn’t come as standard. Obviously, as we’ve suggested, these are not the strongest, most abrasion-resistant jeans on the market, but in our view they’re still way better than those jeans with just a tiny slither of Kevlar in the bum, hips and knees. 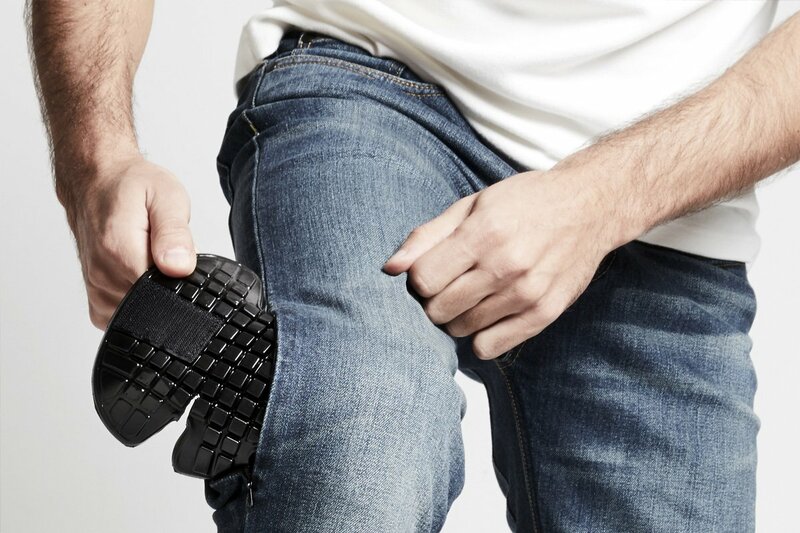 After all, as a single-layer jean, the J-Trackers deliver their 2.1 seconds all over. The Spidi J-Tracker jean in medium blue. In truth, if you spend a lot of time on the motorway, and if you’re the kind of rider who is always on it, never missing an overtake, never wanting to lose momentum in the turns then, yes, perhaps the J-Tracker is not for you. But if your riding is a bit more relaxed, if your journeys are local or around town, you might take the view that the J-Tracker is more than up to the job. I love my Rokkertechs for proper trips, but for riding into work, for going up to Newlands Corner for a bacon sandwich, and even for riding from Guildford into London, I will usually wear my Spidis out of preference. And for wearing all day long, there’s not a protective jean to touch the Spidi J-Trackers. All we’re saying is this; everything is a trade-off. Whatever it is you wear, there’s nearly always something that’s more protective. But sometimes one is prepared to accept a slightly lower level of protection in return for a higher level of comfort and wearability. There’s also a price component here. For some people, price is not the driving force, and £350 for a pair of Rokkers is not an issue. But clearly the £150 Spidi jean is a much more affordable option. For me, though, there are times when I’d just rather ride in my Spidis, because they’re nicer to wear. 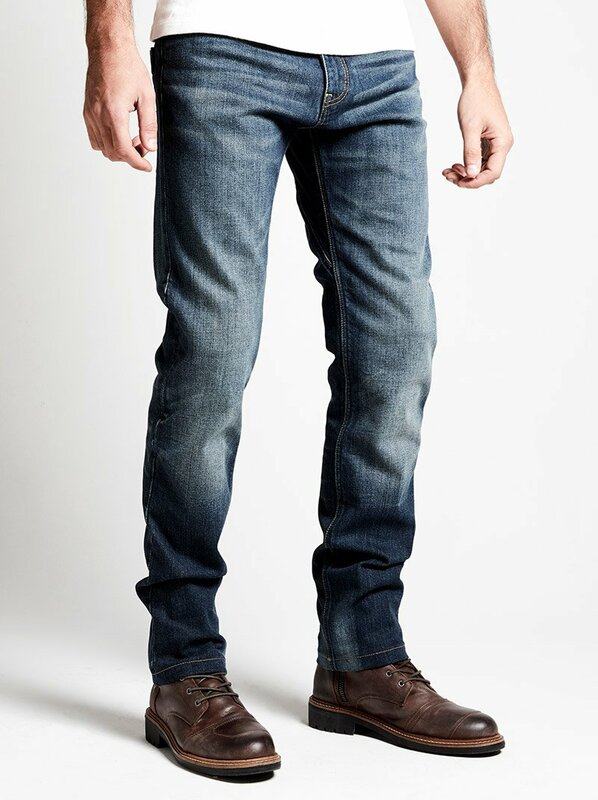 The J-Tracker jeans from Spidi are simply the most comfortable, motorcycle jeans you’ll ever wear. They’re just not the most protective! Just one word of warning. Order one size up from your normal size; the fit is very Italian! Click Spidi J-Tracker jean to shop the Spidi J-Tracker jean.